Reminder: The application due date for Supplements for Collaborative Science is May 15. For details, see this related Feedback Loop post. The NIGMS Models of Infectious Disease Agent Study (MIDAS) is a collaborative network of about 100 scientists who use computational, statistical and mathematical models to understand infectious disease dynamics. As we mark the program’s 10th anniversary, we invite you to join us for a symposium titled “Modeling for Science and Policy” on September 23 from 9 a.m. to 4 p.m. EDT at the Lipsett Auditorium on the NIH campus. You can also watch the symposium remotely (live or later) via the NIH Videocast Web site. The program will feature short talks by MIDAS researchers on modeling for scientific understanding, for health policy decision making and for preparedness planning. We’ll post more details about the symposium when they’re available. We also welcome scientists to apply for grants to become part of the network. We just released funding opportunity announcements for MIDAS centers of excellence (U54), an information technology resource (U24) and research projects (U01). Since its inception, MIDAS has pioneered the use of computational and mathematical models to prepare for, detect and respond to infectious disease threats. In addition to doing basic quantitative and computational biology, MIDAS works closely with local, state and federal public health agencies to facilitate the use of modeling in decision making. The network’s models, software and other resources, including information about historical epidemics, are available through the MIDAS portal . If you’re interested in modeling and/or infectious diseases, I invite you to explore this site, and I welcome your questions. CORRECTION: The symposium will take place in the Lister Hill Center Auditorium on the NIH campus. We were very sad to learn of the death of Adolphus Toliver, Ph.D., on March 26. 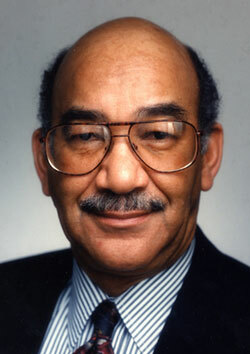 Dr. Toliver–or Tol, as he preferred to be called–was a staunch supporter of diversity. His vision and dedication to increasing the participation of underrepresented minority students in biomedical research resulted in the development and improvement of many NIH programs. Tol joined NIH in 1975 as the executive secretary of the biochemistry study section in the former Division of Research Grants (now the Center for Scientific Review). He was instrumental in assessing the emerging areas of biochemistry and molecular biology, which resulted in the creation of two new study sections, and increasing the participation of women and underrepresented minorities in his study section. Tol also advised innumerable young biochemists who became successful grant writers and prominent researchers. In 1994, Tol joined NIGMS as chief of the Minority Access to Research Careers (MARC) Branch. In this position, he found his true calling, because he was a great and natural mentor and was able to continue to touch the lives and careers of many, especially those participating in the MARC program. Tol’s contributions as an exec sec and as MARC Branch chief will have a lasting impact on science and the scientific community on many levels. However, he will probably be best remembered as the “father” of the Annual Biomedical Research Conference for Minority Students (ABRCMS) . Now in its 13th year, ABRCMS has grown to a 4-day event that was attended last year by more than 3,300 student and other participants from across the nation. Eligibility is restricted to FEMA-declared major disaster states, and funds are limited to those made available by the Disaster Relief Appropriations Act of 2013. As discussed in a blog post from NIH’s Sally Rockey, NIH anticipates announcing additional opportunities and resources related to the Hurricane Sandy recovery effort. If you’re interested in becoming a health scientist administrator or program director at NIGMS or another part of NIH, here is information from NIH’s Office of Human Resources (OHR) to help you navigate the job application process and prepare a strong application package. NIGMS and other NIH components post every job opening on www.USAJOBS.gov , the official Office of Personnel Management (OPM) job site that services all federal agencies. These job postings are referred to as “vacancy announcements.” If you’re not relying on sources such as NIGMS’ Feedback Loop to alert you to specific job openings, we at NIH OHR encourage you to use the USAJOBS search engine to target positions of interest. When utilizing USAJOBS, an important item to be aware of is the vacancy announcement’s closing date. Many NIH announcements are advertised on USAJOBS for 5 business days. This is in response to the President’s Executive Order mandating hiring reform measures to streamline and accelerate government hiring processes. In some cases, original closing dates may be extended, but applications cannot be accepted once the closing date has passed. We recommend that you keep your USAJOBS account—including your profile and supporting documentation—current so that you can quickly respond to new vacancy announcements. USAJOBS also allows you to store cover letters, certifications and unofficial transcripts in a “saved documents” section. Applications received through USAJOBS are initially reviewed by an OHR human resource specialist who identifies highly qualified applicants and refers these applicants’ resumes and documentation to the selecting official. Because of the highly rigorous qualification process mandated by OPM, it is critical that your resume accurately describes your major activities, responsibilities and scope; a curriculum vitae with job titles and dates is not enough information for qualification purposes. For more information, please see these tips for developing effective federal resumes .